"I am sailing, stormy waters, to be near you"
A steep footpath from the village leads down to a beautiful bay made up of rocks, pebbles and sand. It is edged by rock pools and backed by steep cliffs along which the Isle of Anglesey coastal path runs. Car park available. 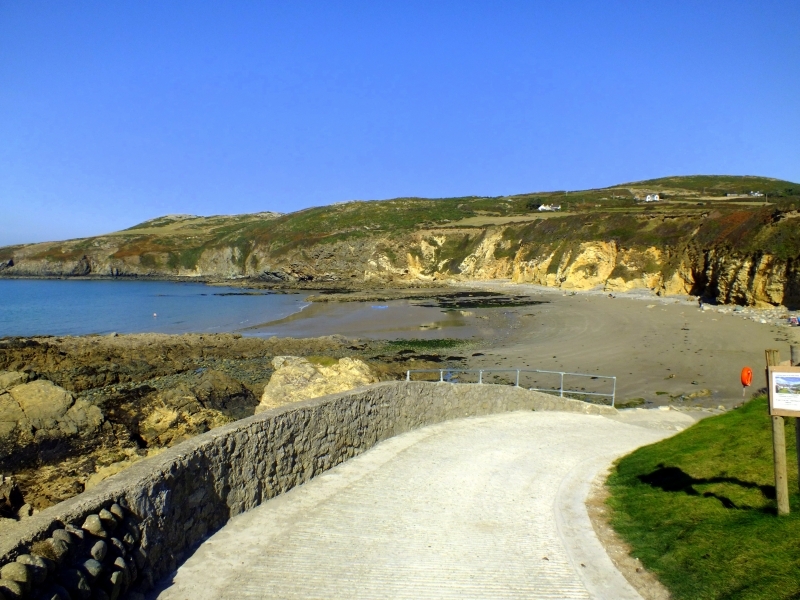 Church Bay is adjacent to the Anglesey Coast Path and the Wales Coast Path. The tide at Church Bay is currently falling. Low tide will be at approximately 10:08 AM, and the next high tide will be at approximately 4:28 PM. There is free parking for 40 cars by the beach. around 5 miles east-northeast as the seagull flies, around 7 miles by road. around 8 miles east-northeast as the seagull flies, around 10 miles by road. just over a mile south-southwest as the seagull flies, around 2 miles by road. around 9 miles south as the seagull flies, around 12 miles by road. around 11 miles south-southeast as the seagull flies, around 17 miles by road. around 11 miles south as the seagull flies, around 17 miles by road. around 12 miles south-southeast as the seagull flies, around 18 miles by road. Visitor information for Church Bay, Isle of Anglesey, Wales. Weather, tides, visitor comments, beach facilities, photos, nearest postcode, beach information and nearby accommodation.